PAOK president Ivan Savvidis stormed the pitch on Sunday, carrying a gun. ATHENS -- Greece could be expelled from international football competitions because of widespread violence, a FIFA representative said on Wednesday. Herbert Huebel said a series of incidents, culminating in a gun-toting club owner running onto the pitch to protest a disallowed goal, were "unacceptable." "Greek football is going to an edge," Huebel said, adding that a potential Greek suspension from international football "is not, any more, impossible." Huebel met government and league officials in Athens following Sunday's incident at a league match between PAOK and AEK Athens in Thessaloniki. The government has indefinitely suspended league play after PAOK owner Ivan Savvidis -- a Russian with strong business interests in Greece -- rushed onto the field, accompanied by bodyguards and with a holstered gun strapped to his waist, when the referee disallowed a goal. Greek league organisers launched disciplinary procedures against Savvidis and PAOK on Wednesday, which could lead to the team being docked points or even relegated and a maximum five-year ban for its owner. "We all love football, but it's unbearable that people are scared to go to a stadium," Huebel said. "How can you bring children there when there are guns on the pitch? "The aim of the game is always to win, of course. But it can't be forced by arms, by threats or even by crime." 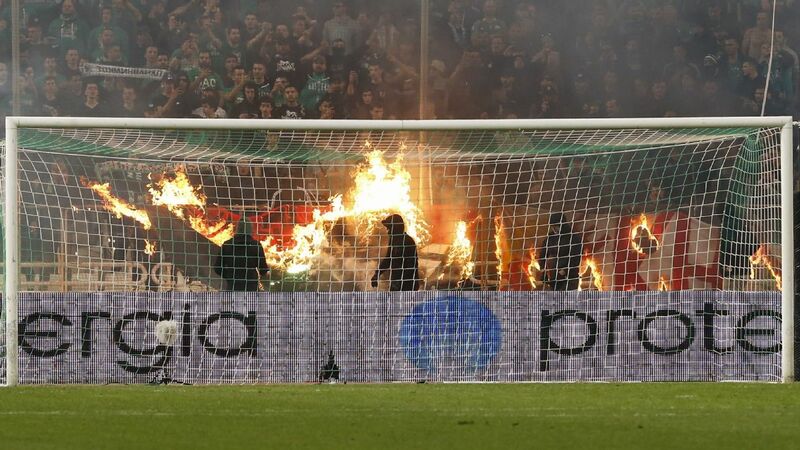 Following Wednesday's talks, Greek football federation president Evangelos Grammenos said league officials would draft a declaration against violence by March 23, after which the government will review its position on the league suspension. "It was decided that professional soccer [officials] will commit in writing to a framework concerning violence inside and outside stadiums, and concerning stadium security," Grammenos said. "If the minister for sports finds these commitments satisfactory, he will decide on whether to revoke his decision." Huebel said he would make his report to FIFA in about 10 days. "The report will be serious," he said. "We don't know what the decisions by FIFA will be. There's a wide range which finally ends up at the FIFA Council. The jurisdiction of UEFA and FIFA can be a very strict one." A public prosecutor has ordered a judicial investigation, which will also look into why police allegedly ignored instructions by a prosecutor to arrest Savvidis on the spot. Savvidis has apologised for his behaviour. More violence was reported in Thessaloniki on Wednesday -- this time at a local school championship game. Police said two people were taken to hospital after clashes broke out between spectators armed with iron bars and wooden bats. Fourteen people were detained.